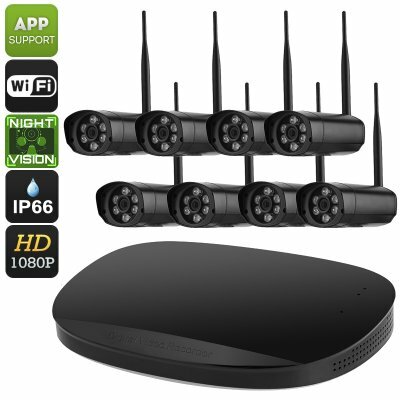 Successfully Added 1080p NVR Kit - 8 Camera, P2P Support, 1/4-Inch CMOS, 25m Night Vision, IP66 Waterproof, SATA, App Support to your Shopping Cart. This Full-HD NVR kit is perfect for increasing the security levels of your home, office, or warehouse. Coming with a total of eight cameras, this NVR kit treats you to great overall security. Each camera features an IP66 rating, meaning it can function in any weather and environment. This makes your IP cameras perfect for indoor and outdoor usage alike. Due to the fact that this is a wireless WiFi NVR kit, all recordings will be stored instantly onto your NVR without the need for any cables. It even supports App and browser access so that you’ll be able to access your security cameras from afar. Each of the 8 high-end IP cameras features a 1/4-Inch CMOS sensor. This allows them to produce Full-HD security footage. Your cameras have furthermore been equipped with 6 IR LEDs each that treat you to night vision capabilities. With a stunning 25-meter night vision range, you can be guaranteed that your property will be protected at both day and night. This beautiful NVR kit supports different recording modes. You can choose to manually turn on your cameras or to let them start recording automatically at a certain time of the day. Additionally, your NVR can be programmed to start filming whenever motion is detected or when an alarm is triggered. Whether you use it to protect your home, office, or warehouse – this 8 channel NVR kit is sure to meet your security demands. This 8-channel NVR kit comes with a 12 months warranty, brought to you by the leader in electronic devices as well as wholesale security gadgets.. Item works very well under Canadian weather conditions. Night vision is amazing! Must position antennas through trial and error in order to get a proper signal to not drop.